"Sampath Speaking" - the thoughts of an Insurer from Thiruvallikkeni: will Chinnathambi be captured ! ~ will it be turned to a 'kumki' ?? will Chinnathambi be captured ! ~ will it be turned to a 'kumki' ?? A day after Chinna Thambi’s 30-km trek to Kottur from Anamalai Tiger Reserve (ATR), he surprised the residents of Deepalapatti village in Udumalai block by showing up in the early hours of Friday morning. Waking up to his trumpeting sound, while residents of Deepalapatti village were taken aback, people from neighbouring villages too gathered to watch the officials on loggerheads with the 25-year-old pachyderm that took only six days to trail back to human habitat. 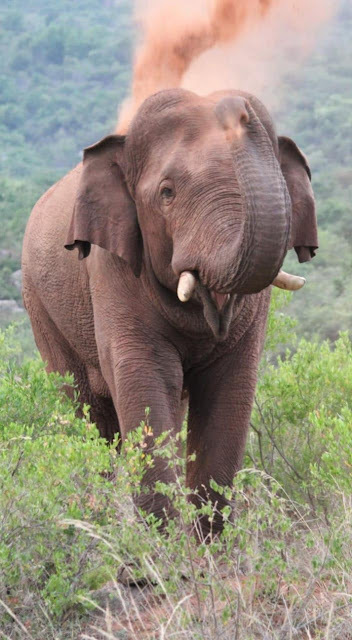 o Though it is mentioned as solitary wild elephant, many reports put that it has a family ! o Lastly, whether any attempt to turn it a kumki, would make it devoid of its natural pride and swagger !! Elephants are very attractive – more so in the wild than in captivity .. sadly its population is plummeting in recent years. Organisations are crying hoarse that Africa is currently experiencing the highest rate of elephant mortality in history, driven largely by a multibillion-dollar illicit ivory trade. Several hundred are killed every week by well-armed poachers seeking ivory, meat and body parts. Ivory, the hard, white material derived from the tusks and teeth of animals, especially the mammoth elephant is very costly. Whether it is costly or useful ~ it looks good on an elephant and is its body part, not an ornamental piece meant for your display…………..
For ages, temple elephants have been a vital part of temple ceremonies and festivals especially in South India. In Kerala, they have a pride of place – as evidenced by the Pooram festivals or the Punnathur kotta, the place for temple elephants at Guruvayoor. Residents of Triplicane will ever remember the great majestic beautiful tusker named “Azhwan” fondly was one who probably never misbehaved. This gigantic one would be bathed, decorated with Thiruman on its forehead and would accompany perumal purappadu. At the end of the purappadu have seen Azhwar offering ‘saamaram’ to Perumal and would walk backwards. It used to carry sacred water (Thirumanjana kudam) from the temple tank, being taken in a procession every morning. Like any other animal conflict, Elephant-human conflict poses a grave threat to their continued existence. Studies on conflict between elephants and humans in Asia and in Africa have identified crop raiding and loss of habitat as the main form of conflict. There is crop raiding, possible injuries and deaths to humans caused by elephants, and elephants being killed by humans for reasons other than ivory and habitat degradation. Such encounters foster resentment against the elephants amongst the human population and this can result in elephants being viewed as enemies and being attacked. Elephants across Asia live in a variety of habitats and landscapes. These include large contiguous areas surrounded by crop fields, or in highly degraded areas with other agricultural encroachments and they are also found in fragmented landscapes with a mosaic of crop fields, plantations and patches of forest. The elephant in news ‘Chinnathambi’ was tranquilised, captured, left off at Topslip forest area but moved back to Pollachi in a village called Angalakurichi. It has GPS attached to its body and thus its movements are observed. The news from Coimbatore is that the translocated wild elephant Chinnathambi, continues to venture into villages near Pollachi and Udumalpet in Tamil Nadu. Reports state that Minister for Forests Dindigul C. Sreenivasan has stated that it will have to be captured and turned a ‘kumki’ [a tamed elephant] The Minister is quoted as stating that the Forest Department took all efforts to rehabilitate the wild elephant in the forest, first by driving it out to the forests of Thadagam valley, its home turf, and then translocating it to Varagaliar forest near Top Slip. "The elephant has been entering villages in the last few days even after translocation and has crossed over 80 km. Now the animal has stationed itself near Udumalpet. The Government has a larger role to protect the lives of the people and their agricultural fields. 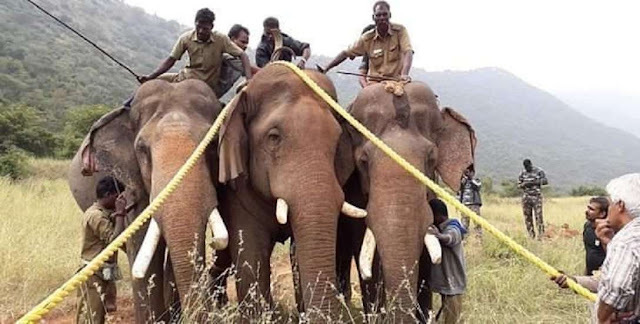 There is no other option left now but to capture the animal and tame it to be used as a kumki," said Mr. Sreenivasan, addressing a gathering at the Ecological Conference for Saving the Western Ghats being held in Coimbatore. Chinnathambi, a tusker aged around 25 years, was translocated to Varagaliar on January 26. On Saturday morning, Chinnathambi was at Ammapatty near Udumalpet. Whether the elephant finds food on entering back villages could be a Q, but it has got fans and people on earlier occasions launched a campaign including printed posters seeking – he be saved and kept back in the forest. Chinna Thambi, the jackfruit-loving jumbo, who was banished by the forest department from Thadagam area in Coimbatore to Varakaliyar near Topslip a few days ago, returned to the spotlight on Thursday, when he wandered into a village near Pollachi looking for food. 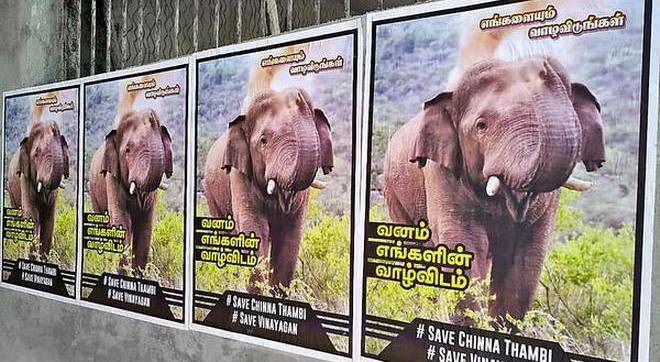 While forest department officials weren’t too pleased with the return of the tusker, the Chinna Thambi Fans club – the 25-year-old is quite the hero among the youth of Thadagam – was elated. The group released a video of the elephant strolling majestically into Angalakuruchi village, set to the beats of ‘Marana mass’ song from the recently released Rajnikanth starrer ‘Petta’. The video went viral, and now fans have launched a ‘Bring Back Chinna Thambi’ page on Facebook and some have started a hashtag #savechinnathambi. Forest officials say Chinna Thambi travelled more than 50km to the village but “did not disturb anyone” when he walked through. “The elephant should be united with its family and the forest department should take necessary steps to bring back the elephant. People blocked the migratory path of the elephant and it was therefore forced to enter villages and agricultural fields. So, we cannot blame the elephant. Thadagam valley was its home,” says the Online campaign. Forest officials say the elephant had been roaming in the Varakaliyar and surrounding areas in Ulanthi forest range for the first four days after it was translocated. On January 30, the elephant moved towards Pollachi forest range and it entered Mayiladumparai, Ponkaliyur village on Thursday at around 6am. “The elephant entered a coconut farm where it damaged four coconut trees. But it did not disturb anyone. We burst crackers and drove the elephant away from the village,” said a range officer, Pollachi forest range. While it would be news that ‘it would be captured and turned a kumki’ – it would well be great pain and loss of its natural way of life .. ..